Half of all packaged consumer goods from shampoo to donuts contain palm oil, but the ubiquitous product comes at a cost—widespread deforestation from plantations, especially in Indonesia and Malaysia, which produce 85 percent of all palm oil. While more than 300 consumer goods companies have committed to tackle this problem by purchasing only “deforestation-free” palm oil by 2020, it’s a lofty goal given the complexity of supply chains. A single company may buy palm oil from hundreds of processing mills, which source palm fruit from thousands of farms. The average business only has the resources to verify a fraction of these suppliers each year—until now. 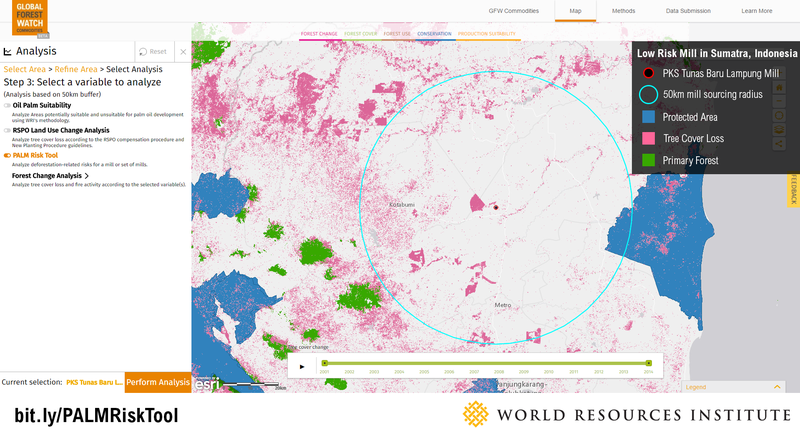 Global Forest Watch’s new PALM (Prioritizing Areas, Landscapes and Mills) Risk Tool illuminates points in companies’ palm oil supply chains that are most likely to be associated with past and potential future deforestation. With this information, companies can proactively manage their supply chains to reduce and eventually eliminate deforestation associated with palm oil production. 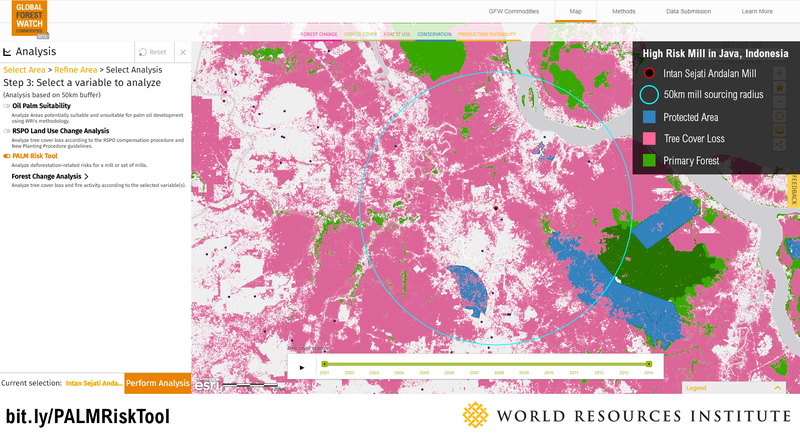 Developed in collaboration with Proforest and Daemeter, the PALM Risk Tool harnesses satellite-based data to measure deforestation risk for nearly 800 palm oil mills, with new mills being added constantly. These mills, visible on GFW Commodities, are the most comprehensive public database of mill locations currently available. Companies can also upload additional mill locations to perform their own custom analysis. Within a 50 kilometer (31 mile) radius of each mill—the distance fresh palm fruit can travel without spoiling—the Tool analyzes fire activity and tree cover loss occurring over time and over environmentally important landscapes such as primary forests and carbon-rich peatlands. The result is a risk ranking for each mill, which helps narrow a company’s focus on the surrounding plantations feeding the mill that may be contributing to deforestation. Palm-oil driven deforestation typically occurs when land is cleared for plantations. Companies that identify a “high-risk” mill in their supply chains can then do additional research, conduct field audits and engage directly with plantations supplying that mill to ask them to change their practices. Located in Riau, Indonesia, the Intan Sejati Andalan mill was ranked as “high risk” by the PALM Risk Tool. The sourcing area around this mill lost more than 200,000 hectares (500,000 acres) of primary forest since 2009. Since preliminary research shows past deforestation is the single-largest predictor of future trends, the remaining 300,000 hectares (750,000 acres) of primary forest is at risk of suffering the same fate. Tree cover loss within the sourcing area, including in protected areas, makes the Intan Sejati Andalan mill at high risk for deforestation. View this area on Global Forest Watch Commodities. Primary forests, untouched by human activity, are some of the most biodiverse and carbon-rich forests in the world. The mill sourcing area also contains the Giam Siak Kecil and Balai Raja wildlife reserves, which house critically endangered species, including the Sumatran rhino, elephant and the clouded leopard. Despite their “protected” status under Indonesian law, Giam Siak Kecil has experienced significant deforestation, and Balai Raja has seen palm oil development within its borders. With this information, companies can quickly identify and work with high-risk mills like the Intan Sejati Andalan to develop strategies that reduce and prevent deforestation in the sourcing area, and ultimately make progress towards their deforestation-free commitments. Data show palm oil development within Giam Siak Kecil and Balai Raja wildlife reserves. View this area on Global Forest Watch Commodities. The PKS Tunas Baru Lampung Mill is a low-risk mill in South Sumatra. Less than 25 hectares (60 acres) of primary forest existed in the sourcing area in 2000, and none of that forest remains today. Additionally, this mill operates in an area completely free of peatland, the most carbon-rich type of landscape, and the overlapping protected area has experienced minimal tree cover loss since 2000. The low risk rating of this mill is corroborated by its certification from the Roundtable for Sustainable Palm Oil (RSPO), an industry- and NGO-led organization that validates the “sustainability” of palm oil. Limited tree cover loss and lack of environmentally important landscapes within the sourcing area makes the PKS Tunas Baru Lampung mill at low risk for deforestation. View this area on Global Forest Watch Commodities. Recently, the RSPO revoked a major palm oil supplier's sustainable certification following allegations of deforestation and labor rights violations. Major consumer goods companies have subsequently cancelled their contracts with this supplier. These actions signal that the palm oil industry is taking commitments seriously. Yet it also highlights the challenges companies face in monitoring and controlling their vast supply chain networks. Companies urgently need tools that will make sustainable sourcing easier, and concerned consumers, governments and advocacy groups need ways to hold companies accountable for their sustainability commitments. The PALM Risk Tool creates unprecedented transparency around the impacts of palm oil supply chains, empowering both companies and consumers alike.